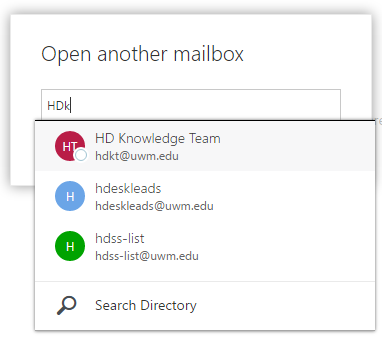 This article describes the process for opening shared mailboxes in Outlook on the web as well as editing shared mailbox membership and ownership. Follow these steps to open a group account as a shared mailbox. 2. In the open another mailbox window, type the shared mailbox's full UWM email address (i.e., mailbox@uwm.edu) and click Search Contacts & Directory (if you've opened this mailbox before, the name should appear as you type). 4. Click Open and the shared mailbox will open in another browser tab. 5. View and send emails for your shared mailbox in the new tab. Note: This is done from the mailbox's owner's user account in Outlook on the web and NOT the shared mailbox itself. To change the membership of a shared mailbox called abc, you must edit the abc-owners@uwm.edu distribution group that appears in your account options. You must also be an owner of the group in order to make these changes. Follow these steps to change a shared mailbox's members or owners. 1. Click membership along the left side of the Distribution Group window to edit the group's members. 2. Click the + icon to add a new member (or select an existing member and click the - icon to remove them). 3. Search for the new member's name or email address and click the + next to their name. 4. The persons name will appear under the save button at the top of the window to confirm that you have selected that person. 5. Click Save to keep any changes you made. Note: Remember to always hit the Save button at the bottom right of the main Distribution Group window! To change the ownership of a shared mailbox called abc, you must edit the abc-owners@uwm.edu distribution group that appears in your account options. You must also be an owner of the group in order to make these changes. Follow these steps to change a shared mailbox's owners. 1. Click ownership along the left side of the Distribution Group window to edit the group's owners. 2. Click the + icon to add a new owner (or select an existing owner and click the - icon to remove them). 3. Search for the new owner's name or email address and click the + next to their name. 4. Click Save to keep any changes you made. Note: All groups must have at least one owner who's responsible for managing the group. By default you're an owner of the group you're creating.